Canning fruit is like giving a present to your future self. I spent a few hours in an orchard last summer and came home with buckets of Suncrest and Faye Elbertas, sun- warm and so ripe they bruise if you look at them wrong, the kind you eat leaning over the sink so that at least some of the juice doesn’t end up running down your neck. What we couldn’t eat fresh, I made into peach butter or sliced and processed in a light syrup in pint jars so that one evening in late March months before any peach that I might be so unfortunate to purchase in a supermarket is even a shadow of what a real peach should taste like, I can pop open a jar and bake a bevy of these buxom peachy muffins. 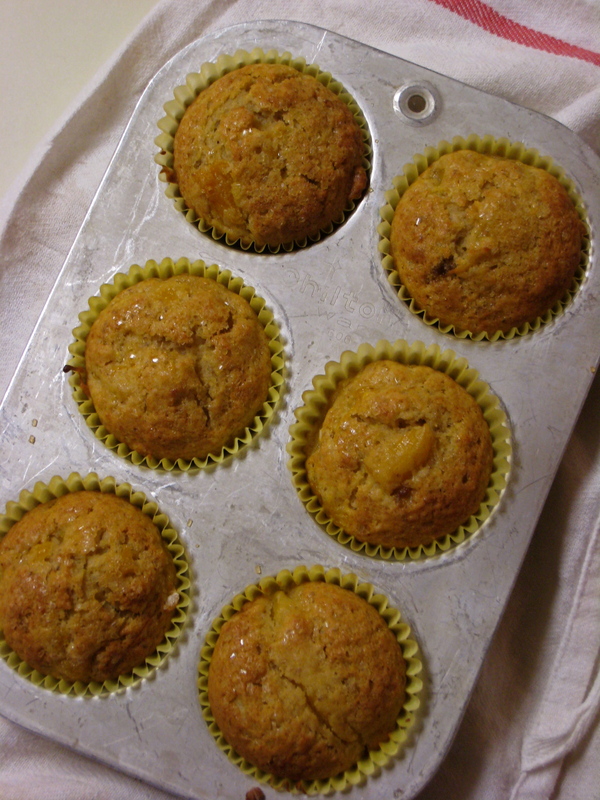 These are lightly spiced muffins whose charm is due not only to the swirl of yellow peach running through them, but also to the crunchy crust that the coarse-crystalled sugar forms on the top, similar to a streusel topping, but lighter and crisper. Using all purpose flour makes the muffins lighter and more tender, and the white whole wheat is slightly denser but not heavy. Either flour (or a combination of the two) makes a lovely muffin. It’s up to you which you prefer. Preheat the oven to 400 degrees. Grease or line 12-15 muffin cups. In a large bowl, whisk the flour, cinnamon, nutmeg, baking soda, salt, and flax seed meal. In a separate bowl, mix the oil, eggs, and sugar. Add the flavoring and peaches. Mix well. Stir the liquid mixture into the dry ingredients. Use a spoon or spatula and fold together until just incorporated. Spoon about ¼ cup of the batter into each of the muffin tins. Sprinkle the tops of each muffin with turbinado sugar. 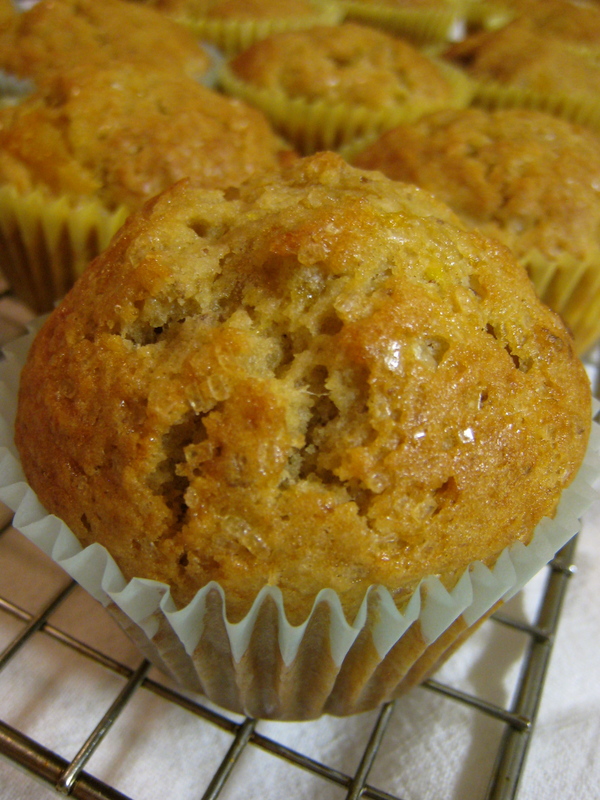 Bake for 20-25 minutes until a toothpick inserted into the center of a muffin comes out clean. As soon as you are able to handle them, turn the muffins out onto a wire rack to cool. Christine; Hope you save one for me! 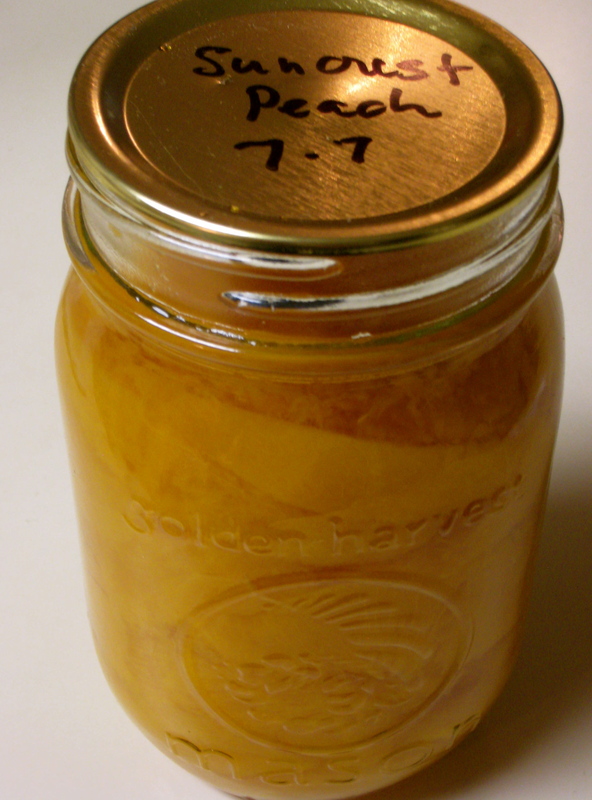 I with try your recipe when the peaches are ripe on my neighbors tree in Locke. I would like it if you can visit us when we are in Locke so you might write about our little town.We will give you the five cent tour. Oh Yeah what’s flax seed meal? Weyland, thanks for the invitation to Locke! Flax seed meal is just ground flax seeds. You can buy them already ground at Trader Joes or Harvest House.